Notes: I tore the duck rather than cutting it up and substituted pea shoot sprouts as I couldn’t find bean sprouts. To make the salad, marinate the turkey strips in 125ml / ½ cup of the dressing; while this is going on soak the noodles in freshly boiled water (from a kettle) and,once re-hydrated (see packet instructions), refresh the noodles in cold water, then drain. Put the sugar snaps and beansprouts into a colander and pour some more freshly boiled water over them. Rinse them with cold water and drain – by shaking the colander – so they’re not dripping wet. 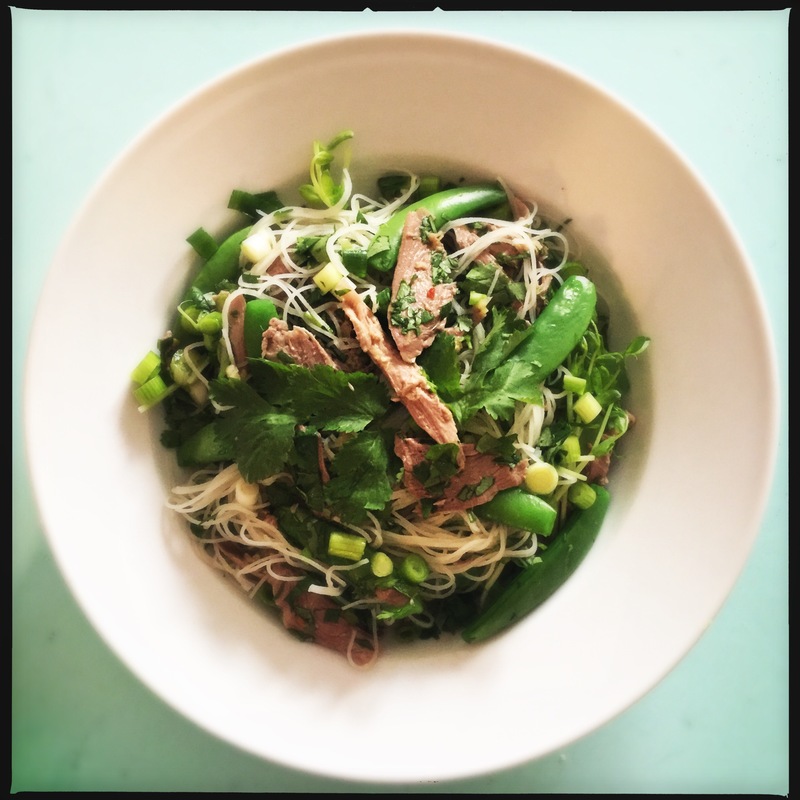 In a large bowl, mix the marinated turkey strips, and the dressing they’re in, with the drained noodles, spring onions, sugar snaps and beansprouts. Dress with the oils and taste to see if you want to add more dressing. Sprinkle the chopped fresh coriander over and toss everything together well before arranging on a large plate. The dressing can be made and kept in a tightly sealed jar in the fridge for up to 2 weeks.